Beer, or any alcohol for that matter, when consumed in moderation, may be a brilliant motivator to keep people working out. There has been a lot of research about the helpful cardiac benefits of drinking in moderation. A daily glass of wine is included in the Mediterranean diet that many doctors recommend to patients as a healthy way to eat. In addition to the celebration motive, they wonder whether people also exercise after they drink out of guilt. Either they plan to drink later or have been drinking before and they want to do something to make amends People may exercise to balance out all the alcohol calories they consumed the night before, since no one wants a beer belly. And, finally, they think people may drink out of a work-hard, play-hard motivation. For lovers of the drink out there, little known fact is that beer, or any alcohol for that matter, when consumed in moderation, may be a brilliant motivator to keep people working out. Scientists still need to do more research as to exactly what the connection is, but several studies have found that people who drink moderately tend to exercise more than abstainers. Mike Zamzow, the brewmaster and owner of Bull Falls Brewery in Wausau, Wisconsin, thinks burpee exercises and beer will be a winning combination for fans of his business. Starting next week, Bull Falls will host “Butts and Beers,” an exercise class that combines some cardio and yoga with beer. There will be no bar curls in class, but you’ll get a beer after you exercise. Zamow got the idea after hearing about a yoga class at a Minnesota brewery. He’s already seen success with the exercise beer combo. A 5K run Bull Falls hosted (with kegs at the end) raised $17,000 for the Never Forgotten Honor Flight last year. Zamzow thinks this exercise class will be something that will help people keep their New Year’s fitness goals. “There may be some who come to the class who figure out they’re not cut out for this, but when they get into the taproom, their classmates will encourage them to stick with it,” Zamzow said. 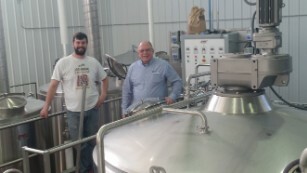 Bull Falls brewmaster Mike Zamzow will play host to the “Butts and Brews” exercise class in his Wisconsin brewery. Zamzow may be onto something. Positive peer pressure has been shown to be a successful exercise motivator in past studies. As has the celebration factor. It’s common to see teams sharing something cold after a win. “But you don’t even have to have a victory, to want to celebrate, you may be feeling good because of the exercise and want to carry on that feeling into the bar,” said Leigh Leasure. She is an associate professor and director of behavioral neuroscience lab at the University of Houston. Leasure co-authored a study that looked at the connection between exercise and alcohol and the research that was available on the subject. There has been a lot of research about the helpful cardiac benefits of drinking in moderation. A daily glass of wine is included in the Mediterranean diet that many doctors recommend to patients as a healthy way to eat. Some studies have even looked at beer as an alternative kind of sports drink (the nutrients in the hops and the sugar can work if sodium is added and the alcohol content is lower). While one study did show that alcohol consumption after exercise can slow recovery, the pluses may outweigh the minuses. Although research on the motivators behind why people who drink tend to exercise more is a little more limited. One theory may be that alcohol and exercise both work on the same pathways in the brain. “There are a lot of parallels in terms of how the brain responds to exercise and alcohol,” Leasure said. Are you a heavy drinker? You’d be surprised. That is if people are doing both in moderation. If they cross over into dependence on either, the brain does not react the same, Leasure said. She and her co-authors next intend to study the connection between the two activities in college students. People may exercise to balance out all the alcohol calories they consumed the night before, since no one wants a beer belly. And, finally, they think people may drink out of a work-hard, play-hard motivation.